Police are investigating the activities of several gangs. Many more are yet to be identified, let alone investigated. 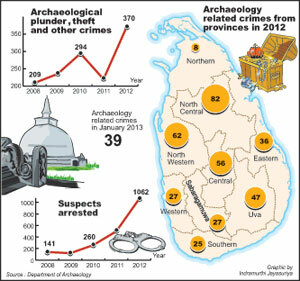 One network of hunters, recently busted, was implicated in three illegal excavations in Wellawaya, Haputale and Buttala. A telephone number scribbled on a wall calendar in the home of a member, led to the discovery that the gang had agents islandwide. One of its main organisers was a security forces deserter from Ruwanwella, who was pretending to be the bodyguard of an influential minister’s wife. Another was a timekeeper from Wellawaya, who was residing in Buttala, as an employee of the Uva Provincial Council. He masqueraded as an officer of the Archaeological Dept. The husband of an Avissawella-based lawyer was involved in all three incidents. The chief financier was found to be the husband of a bank manager in Colombo. 1,000 rupees is about $8. So for this dig alone, the labor cost is $36,000 (50 people digging for three months at $8). Add in the costs of a laser gun or generator, and it is clear that someone must be willing to pay quite a lot for the artifacts being stolen in order for this kind of operation to yield profits. Before each excavation, a “kattadiya” (exorcist) performed ceremonies. Undercover agents intercepted some of the items by infiltrating the smuggling ring. “We were able to set up some meetings and view these artifacts posing as buyers,” said Bill Fort, a Homeland Security Investigations agents who helped crack the case. Fort, now retired, said the thieves offered to get more items for collectors. “They would go out and dig something up, or go other co-conspirators and say, ‘Hey, we have an order for this type of artifact, do any of you all have it?’ or, 'Let’s go out to some of those sites that are protected areas in Mexico,’ and they would dig through those," Fort said. You can not only get your illicit antiquity wholesale, cutting out the middleman, but you can get it to order. None of this will show up on the market or in the museum. What does this tell us about where we ought to be focusing our efforts to prevent future digging of antiquities? The answer seems clear: we need to be figuring out how to increase the resources devoted to anti-looting and anti-smuggling policing operations, including but by no means limited to the sort of sting operation described in this article. To say this is not to suggest that auction houses, dealers, donating collectors, and museums should be simply left alone, or that restitution should not be demanded by countries when a looted artifact comes to light. 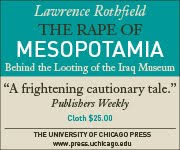 But if what is really needed to stop looting going forward is more and better site monitoring, more and better guards for sites, more and better antiquities police going after smuggling networks, then what we demand from the licit antiquities market should be not just clean hands or givebacks, but help in generating funds for all these efforts. They should be asked what they are doing to help make sure their market really is licit, and why they aren't doing more. That more could be any number of things: using their authority and political heft to push our government to spend more on this problem both in Homeland Security and via State and Defense Department efforts to assist antiquities police in other countries; creating a foundation and endowing it (imagine what good the $200 million Shelby White gave to establish an institute for studying the ancient world would have done had she instead set up a foundation to support more and better antiquities policing); or lobbying the US government to tax the purchase of antiquities to generate funding that would go to pay for things like more undercover operations of the kind that this article shows can be successful.